The government doesn’t have time to wait for the recommendations, due some time next March, from the Royal Commission into the Protection and Detention of Children in the Northern Territory. The time of peak offending, the middle of summer, is around the corner and action is needed now: That was the tenor of Dale Wakefield’s address to the town council last night, and of the questions to her from the councillors, at their final meeting this year. And what if the government’s course of action is in conflict with the Royal Commission’s findings? “We have a mandate from the community. 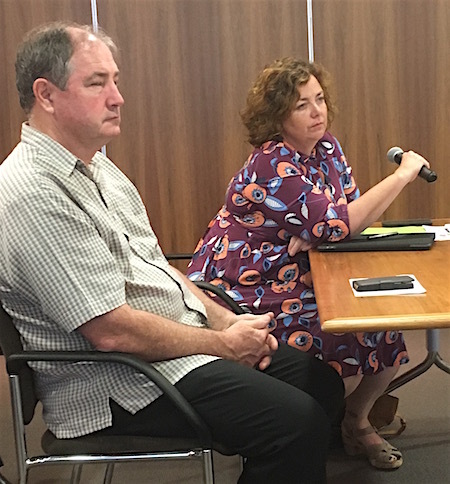 That is something we would work through, if and when it happens,” said The Centre’s only front-bencher, the Minister for Territory Families, speaking with the Alice Springs News Online after the meeting. If the government is set on determining its own course of action, are we wasting millions of dollars on a Royal Commission? “No, it’s us fully cooperating with the commission. One of the things we have agreed with the commission is to keep them updated by giving them submissions as we develop things so that they are clear about what our reform direction is,” said Ms Wakefield. This would avoid – as she had told the meeting earlier – “conflicting” recommendations from the commission, set up by the Turnbull and Giles Governments after a mere few hours’ consideration of material aired by Four Corners. Inside the council chamber Ms Wakefield’s focus had been on what to do about troubled and troublesome kids. They have already been taken out of the realm of the adult justice system and made a responsibility of her department. She praised the council’s collaboration with Congress on the Youth Patrol – a bus service taking kids roaming the streets at night to a safe place. The current program is due to run out at the end of January but Ms Wakefield hinted there would be further government money for an extension, after a restructure, for a “significant period of time” while policies are being developed. Cr Jade Kudrenko said time for clarity is now because the council needs to negotiate with staff if the project is to continue. Ms Wakefield said contrary to expectations there is no Budget line for the program, and money would need to be found. She said Anzac Hill remains a “difficult area” but the the council has agreed to remove rocks “hopefully soon” so they can’t be thrown. There will be more lights near Beaurepaires, with government money. The government wants to extend its efforts to support kids to become productive members of society: Not only will programs have a longer funding life, five years or so, but they will extend well into people’s adulthood, measures that are “strong evidence based, outcomes focussed” with lots of “community input”. Cr Eli Melky said given that local government is often the first port of call, could it be empowered to do more in the youth field, such as using its extensive venues and sporting fields in leadership programs. Ms Wakefield replied it’s worth talking about, maybe as part of a “cohesive plan” also including the Federal Government. Cr Steve Brown said the town should not be “hamstrung” by the Royal Commission – action to prevent the usual hot season troubles is needed now. Ms Wakefield said there is an “opportunity to be bold, break the cycle”. Deputy Mayor Jamie de Brenni asked if Ms Wakefield had been in touch with Rob Clarke Redtails / Pinktails initiative, and its plans for developing Blatherskite Park. She said she had had a couple of meetings with Mr Clarke, described the initiative as “bold and fantastic” and was “looking at ways to help, without making …” The word left unspoken here seemed to have been “commitment”. Cr Jade Kudrenko raised the planned $7m juvenile detention facility in Alice Springs. Ms Wakefield said the service model is still being worked on. Kids should not be sent to Darwin. A distinction needs to be made between those sentenced and those on remand. It was Cr Brendan Heenan who seemed to have pointed at the elephant in the room: He said we’re just chasing our tails if any long term strategy doesn’t include parents of problem kids. PHOTO: Minister Dale Wakefield with Lutheran pastor Ken Schultz who opened last night’s council meeting with a prayer. Really, left wing, do-gooding political correctness using tax dollars for people that won’t have their own parents and family take control of the situation. Remove the rocks. Next they will vacuum the hill to get rid of the dirt. Apparently the little angels couldn’t possibly gather rocks elsewhere and take them up there. I think we need a banned rock register.